This month's edition of the box has now been published! 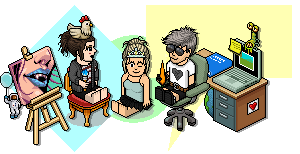 It contains a list of who has won what in the Habbox Summer Spectacular and Awards, a trip back in time, a spotlight on the Ambassadors department, competitions, an interview with a certain member of the Habbox community... and more! To check out the first edition, it's available on the Habbox homepage, or you can CLICK HERE! If you'd like to contribute, feel free to send me a PM or contact me in any other way! If you have an idea for The Box and would like to share, please use THIS FORM and select Feedback in the drop-down menu up top! You can also use this form to submit content to be included in other sections! Thank you - I hope you like it!